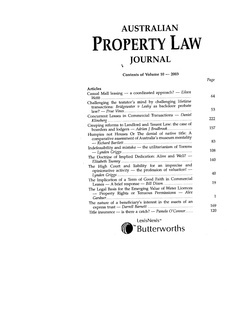 In Lukacs v Wood ((1978) 19 SASR 520) and Tutt v Doyle ((1997) 42 NSWLR 10) it was accepted that rectification could form the basis of a personal equity sufficient to establish an in personam claim. However, there are a number of cases (Medical Benefits Fund of Australia Ltd v Fisher [1984J 1 Qd R 606; State Bank of New South Wales v Berowra Waters Holdings Ply Ltd [1986J 4 NSWLR 398 and Tanzone Ply Ltd v Westpac Banking Corp (1999) 9 BPR 17,287; NSW ConvR 55-908) where the plaintiffs were no 'less deserving of protection, but indefeasibility prevailed over any possible equity. This article examines these cases and finds that there is no convincing reason for the differences. What this reiterates is that while the Torrens system of land registration will operate for the benefit of most, in some instances innocent people will suffer. This reinforcing the utilitarian focus of title by registration.